Here is the card I made for my mom's birthday this year. I used Splitcoast's Color Combo #171 which is Soft Sky (retiring), Kraft and Black. I love Soft Sky and Black. I also love Soft Sky and Chocolate. I'm sorry to see Soft Sky go, but I believe one of the new In Colors is a close match, maybe a bit darker. 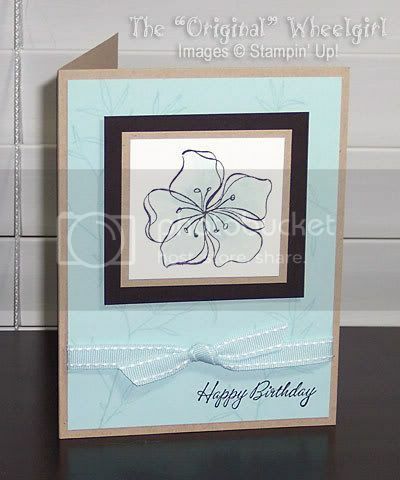 I used the Embrace Life stamp set for this card, and also the Happy Birthday stamp from the Warmest Regards set. Once again I tried my hand at watercoloring using Soft Sky ink from the pad and a waterbrush for the focal image (stamped in black Stazon, matted in Kraft and Black cardstock, and attached with dimensionals). The background is stamped on the Soft Sky cardstock in the same ink, with a piece of Soft Sky double stitched ribbon tied around it and attached to a Kraft card base. Thanks for looking!